(CNN) -- Williams' form in recent years has not been befitting of a team boasting one of Formula One's richest legacies. The British marque have collected nine constructors' titles in an illustrious 34-year history, a total only bettered by the legendary Ferrari. Ferrari and McLaren are the only teams to have won more drivers' titles than the British-based outfit's seven crowns, but founder and boss Frank Williams last lifted a championship trophy in 1997 with a clean sweep of the sport's major honors. Without a race win since Colombian Juan Pablo Montoya claimed the 2004 Brazilian Grand Prix, Williams will want to improve on a 2011 campaign which recorded just five points and a ninth-place finish in the constructors' standings. The Venezuelan became only the fourth driver from his country to compete in the elite division of motorsport, and the first in 27 years, when he made his debut at the 2011 Australian Grand Prix. But Maldonado's breakthrough season was tough and ended with just one world championship point and six retirements in 19 races. The 26-year-old's solitary point came thanks to a 10th placing at August's Belgian Grand Prix. 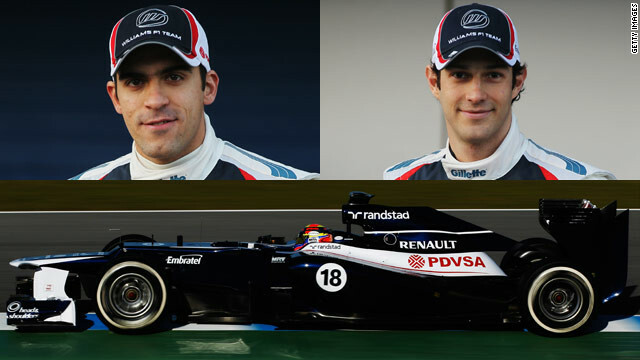 It was a rare highlight in a season which saw Maldonado struggle with the unreliable FW33 car. With the state-owned Venezuelan energy company PDSVA backing Williams, Maldonado will hope to prove he has been retained based on his talents rather than his sponsors. When the Brazilian gets behind the wheel of an F1 car, he brings with him the ghost of one of the sport's greatest champions. Bruno's uncle Ayrton Senna was a three-time world champion and a hero in Brazil before he died following a crash in San Marino in 1994. Ayrton was driving for Williams at the time of his fatal accident, in just his third race after leaving McLaren -- making the team's decision to replace another Brazilian, the veteran Rubens Barrichello, with Bruno all the more meaningful. After a stop-start career to date, which has included stints with F1 newcomers Lotus and HRT, the 28-year-old Bruno will be hoping 2012 is the year he finally steps out of his uncle's shadow.